Whether it be a troubleshooting a software or microphone issue or simply a "how do I" kind of question, we have found that certain topics keep arising. So rather than leaving you to swim the confusing territory of on-line forums or Nuance support, we thought it would be helpful to provide a place in which the most common issues are distilled and presented to you. How do I optimize accuracy when using Dragon? The "holy grail" of speech recognition software is high levels of accuracy. Although many factors impact your accuracy, including dictation style, hardware (both microphone and PC), and freedom from external noise, far and away the most important factor is how you speak. It is critical that you enunciate carefully and speaking in a flowing manner (sentences or phrases). Learn more about optimizing accuracy using the links below. Re-run the audio set-up wizard and upon completion of the second phase (quality check) click on the "play" button to hear your recording. Be sure there is no obvious static or other sign of audio trouble when listening to your recorded speech. Look for other programs that might be using up your RAM (press Ctrl + Alt + Del, click on "start task manager", click on the processes tab and see how much of your CPU is being used (ideally it should be under 20% or so). If the CPU usage is high, consider stopping some programs or processes that are consuming your processor capacity. I have tried a couple of microphones with Dragon and my accuracy is terrible. Should I try a better microphone? If you were getting terrible results when using two separate microphones, there was something seriously wrong with your set-up and way beyond an issue related to microphone characteristics or quality. If neither of these worked, I would not expect another microphone to offer anything better. Although Dragon offers you the option of "skip training" when you set up a new user profile, it is definitely beneficial to perform the recommended 6 minutes or so of training. Although a good microphone can boost your accuracy slightly, the most critical determinant of accuracy is the way you speak. The two important things are to enunciate clearly and to speak in either phrases or complete sentences. If you still have either of the above two mics around I would suggest you create a new profile with one of them and use it in a quiet setting doing your best to enunciate carefully. If it doesn't work well, then I would start to explore whether there is something wrong with your PC. Perhaps your processor is overwhelmed with other operations? One simple reality check is to run the audio set-up wizard for a mic and after completing the second step (accuracy assessment) click on the "Play" button to hear your speech. Listen for any obvious static, noise, sound drop-out etc. But again, I would recommend AGAINST buying another microphone until you better understand why the two you have tried worked so poorly. Accuracy Improvement Guide - This is a product of speech recognition solutions and is a brief overview of things you can do to optimize accuracy. Tips for accuracy with Dragon NaturallySpeaking - This is a guide from our UK partner, Peter Maddern, at Speech Empowered Computing. How do I test my audio or reset it? If Dragon is running, the simplest way to test and reset your audio is to run the "audio set-up wizard. This is the process of asking Dragon to reset the input volume of you speech and to confirm overall audio quality. You can launch the audio set-up wizard either by saying "check audio" or navigating to Tools > Accuracy Center > Check Audio Settings. The very act of running the audio set-up wizard will often solve issues. In addition, after the second phase of the process (the quality check) you can click on the "play" button and listen to your recorded speech. This is a great opportunity to hear (generally) what Dragon is hearing and determine whether there are obvious problems such as static or drop-out of speech. If so, this is generally a sign of a mechanical problem, such as a bad microphone, bad sound card, or bad cable. I just switched to a new microphone and Dragon isn't recognizing it. What's wrong? This is a common problem, particularly when switching from an analog microphone to a USB microphone. It's also a common problem with the Microsoft Vista operating system which treats any new device with skepticism. In general, when moving to a new microphone you should either create a new sound "source" for your current user profile, or create an entirely new profile for use with the new microphone. For details about these processes, see the Microphone Set-up and Troubleshooting Guide below. If you are using Windows Vista, in addition to passing along our sincere condolences, we suggest that you visit our Vista Microphone Troubleshooting Guide below. I'm using Dragon 10 or earlier and the Speech to Noise (S:N)ratio on the audio set-up wizard is on the low side. Does this mean I have a poor microphone or audio problem? In a nutshell, no. The S:N ratio shown following the quality assessment step in Dragon 10 and earlier is intended only to serve as a crude indicator of the quality of your system and any number between 15 and 25 is fine. In version 11 and beyond, in fact, Nuance did away with giving you a quantitative report and simply provides a "Pass" or "Fail" for this step. We have found that some of the best microphones (the Sennheiser ME3, for instance) tends to give lower S:N ratios. To give you an idea of how unimportant this number is within the acceptable range, if you pause briefly after each sentence while doing the reading during the quality assessment step, this will boost your ratio significantly ... and yet this actually changes nothing within Dragon - nothing is actually adjusted or changed during the quality step. So the bottom line is judge your microphone and audio system by the quality of the result and not the number you see during the audio set-up wizard. Compatibility: most commonly sold external USB sound adapters are specifically made for use with the common electret microphones sold for use with computers. As a result they provide the right voltage and comparability is pretty much certain. On board sound cards tend to be some added circuitry on the motherboard and not a dedicated device, so they are much more variable. In the case of an Apple computer, normal computer microphones simply don't work when plugged into the microphone port and MUST be connected with a USB adapter. Freedom from Noise: many with advanced knowledge of computers say that the internal environment of a computer is "electrically loud" and suggest that this might interfere with or degrade the analog to digital conversion accomplished by an on-board sound card. Theoretically, then, an external sound card does its job outside of this loud environment and - ideally - with better accuracy. User Profile Portability: Since the analog to digital conversion and sound card quality and characteristics are part of what defines your user profile, if you need to move your profile from one computer to another, you don't have to worry about variabilities which might result from a change in on-board sound cards. Both the software and sound conversion device will be the same if you move the external sound adapter with your software. If you are using a microphone which does not include speakers, a "monoplex" USB adapter will simplify things a bit in so much as plugging it in will not do anything to alter your system's default sound out device. When a "duplex" adapter (one that handles both sound in and sound out via USB) is plugged in your operating system tends to assign it as the default sound-out device, which may not be what you want if your microphone doesn't have speakers. It is for this reason that we bundle the Sennheiser ME3 and Audio Technica 8HEmW (both microphones without speakers) with the simple monoplex Andrea USB adapter. Most of the newer external USB sound adapters include circuitry/software to accomplish digital software processing which can effectively filter the sound signal and reject some noise and non-human-voice frequencies. Examples include the Andrea Pure Audio USB Adapter, the Buddy 7G, and the soon-to-be released SpeechWare USB adapter. Some USB adapters add additional features. The soon to be released (expected November or December of 2012) SpeechWare USB adapter includes both auto-gain technology (automatically adjusts the strength of the incoming signal based on input level) and extensive digital processing capabilities to provide a particularly high quality end-result. Microphone Set-up and Troubleshooting Guide: this thorough guide should be read by every speech recognition user and certainly should be considered when setting up a new microphone with the Windows version of Dragon. Removing Speaker Echo with Windows Systems: If you are getting an annoying echo from your PC speakers when using your microphone, read this quick tutorial for the solution. Vista Microphone Troubleshooting Guide: If you are using Windows Vista and are having trouble setting up a microphone for use with Dragon, this guide might provide some needed assistance. Making a simple sound recording on a Mac: This brief tutorial we found elsewhere shows you how you can troubleshoot your microphone by making a simple recording with QuickTime. For many users, particularly those who engage in repetitive actions on the computer, the use of commands can be a huge productivity/efficiency enhancer. As an example if you commonly insert your full name and address in the course of your correspondence, you can do this on the fly by saving your full address as a "text command". Inserting the text into a document involves nothing more than stating the name of command. If you are an attorney or physician and use certain chunks of text on a regular basis, these are perfect things to build as text commands for easy insertion wherever appropriate. In the example above, any time you pause briefly and say "My Address", Dragon will insert the address you added to the content of the command editor. For simple text commands, you can select an example of the text you want to build into a command and simply say "Make that a command". 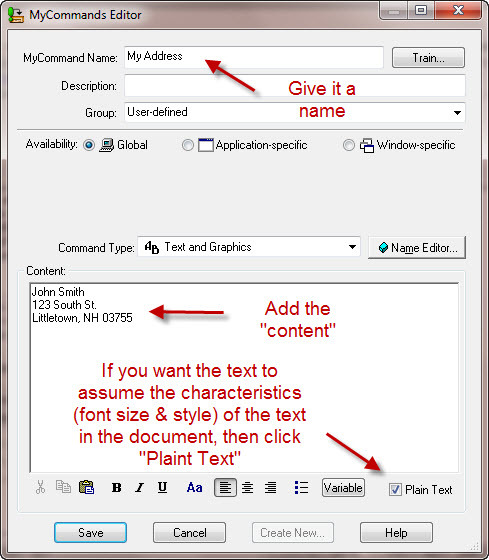 Dragon will open the MyCommands Editor and automatically transfer the selected text into the content area. All you need to do is name the command and save it. It doesn't get much easier! Where can I learn more about building commands? We have put together a very simple command building guide which is shown in the "links" area below, but for a more serious introduction to building commands we suggest you read Larry Allen's book "Scripting for NaturallySpeaking". Is there someplace I can download ready-made commands? Yes. Speech Recognition Solutions has put together a short collection of commands which you can download and import into your Professional, Medical or Legal version of Dragon (sorry, the home and premium versions don't allow export or import of commands). Can I move commands from one computer to another or one user profile to another? In a nutshell, yes, if you have any of the advanced versions of Dragon (Professional, Medical, and Legal). Doing so involves exporting your commands from the Command Browser, saving them somewhere, and then importing them from the command browser in the other user profile. For details on export and import of commands, please view our short tutorial shown in the link below. Dragon Medical Practice Edition 2 is placing an extra line after some text commands. Is there anything I can do about this? This is a quirk of the new DMPE2 when using text commands with formatting (and when the "plain text" box is not checked) and hopefully Nuance will fix this in the near future. Until then, we offer some admittedly annoying fixes at this location. Speech Recognition Solutions Basic Command Building Guide: This is a bare-bones guide to building commands with Dragon NaturallySpeaking and should be considered only a starting point. Scripting for NaturallySpeaking Book: This excellent book, written by Larry Allen, is an excellent place to start your serious journey into command building. It costs about $40 and is an solid investment if you want to optimize your efficiency when using Dragon. Dragon Commands for Downloading: This is a series of commands which can be imported into a Professional, Medical or Legal version of Dragon. Knowbrainer: For a quick "jump-start" to your efficiency, we recommend you consider the addition of "Knowbrainer" to your Dragon. This product adds more than 11,000 commands to your user profile. Moving Commands from One Profile to Another: This is a brief tutorial showing you how to export commands from one user profile and import them into another. Dragon NaturallySpeaking Creating Voice Commands: This is an old document that details creating commands using the legacy DVC type commands which still work in new versions of Dragon. It's a great reference manual for command builder. Here we share with you recommendations from Nuance ... and our own recommendations. The install process checks that your system meets the minimum requirements; if they are not met, Dragon NaturallySpeaking will not be installed. For the latest technical details, please see Support’s KnowledgeBase. A Nuance-approved noise-canceling headset microphone (included in purchase). See details at support.nuance.com/compatibility/ (includes USB adapters and digital voice recorders). I'm contemplating buying a new notebook computer for use with Dragon. What should I buy? If you are contemplating purchasing a new laptop, it's important to note that, as a general rule, a new and more powerful laptop will not bring you improved accuracy, but rather, lower latency (improved speed of operation). This is a major factor in the usability of the product though, so it is important. Dragon is one of the few programs that can tax a modern CPU, and Nuance's system requirements and recommendations are woefully inadequate in our opinion. The bare minimum specs they list are so bad that we've seen systems that were unable to even manage the user adaptation process, which I would consider to be a core part of the software. Without going into too much detail on the CPU side of things, we recommend an Intel Core i5 as the minimum; if an i7 is in your budget, the larger L2 cache will be beneficial. All of these will be dual-core models, which should be fine as long as you aren't doing much multi-tasking - Dragon can only use two cores anyway, so a quad-core CPU only helps if there are other programs using those cores. While 4GB of RAM is the minimum you'll want, RAM is relatively cheap right now, so we recommend getting at least 8GB. If you're at all technically inclined, you can usually upgrade to 8GB or 16GB for much less than it costs from the manufacturer. Another nice upgrade is a solid state drive, or SSD. This won't really have much impact on Dragon, but will dramatically boost the overall performance and responsiveness of your system. We generally recommend going with a "business class" laptop, such as a Dell Latitude, Lenovo ThinkPad, or HP ProBook; they tend to have fewer issues, last longer, and you often get better support. You should try to stick with Windows 7 if at all possible, unless you get something with a touchscreen. If what you want only comes with Windows 8, try to get the Pro version so you can use the downgrade rights to revert to Windows 7 (or plan on just buying a new Win7 license). One final note: Intel is supposed to be releasing their next generation CPU, "Haswell", in June of 2013. Performance will see a minimal boost, but it will be a huge jump in battery life. If you can, you should wait until these start to come out so you can either get the latest-and-greatest, or get a better deal on an older model. For many users it is preferable to "dictate now and transcribe later". A portable digital recorder is the perfect way to make this a viable work flow. Do digital recorders work well with Dragon? Actually they work quite well. It's a little laborious to set up a user profile for a digital recorder, but once you have done so, the actual quality of the result is remarkably good. Is there a downside to using a digital recorder with Dragon? In our opinion, the one downside of using a digital recorder is the lack of immediate feedback on transcription accuracy result and subsequent failure on the part of the user to make adjustments in dictation style. The result is that the user will probably not develop the practiced clear enunciation style that leads to the highest levels of accuracy. So the result may be the need for a higher level of error checking on the final result. This having been said, corrections can still be made to the final product and this will, in fact, lead to improvements in the final accuracy even if the user is not altering his/her dictation style. Select as the new dictation source either a "digital audio recorder" or "Hand-held or smart-phone with recording application" depending upon what you plan to use. Follow all the instructions, including doing the prolonged reading and then uploading this to your computer and allowing Dragon to process this to complete the user profile. The expensive devices tend to come with docking stations and transcription management programs which can streamline the process of connecting and downloading digital files from the device. The expensive devices tend to have side mounted slider switches which allow simple thumb-controlled toggling between record, stop, playback and other modes, so dictation tends to be a bit more easy to coordinate. One thing to keep in mind is that most popular high-end digital recorders are significantly larger than the inexpensive digital recorders and cannot be practically kept in breast pocket. The current line of inexpensive Olympus recorders are so small and thin that they easily fit in a breast or pants pocket. Another advantage of the less expensive units is that they have slide-out piece that interfaces with your computer, through which they can both charge and transfer files, so there is not need for docking stations, cables, etc. I have a digital recorder and wonder if it is possible to automate the transcription process? Yes, there are several ways to transcribe the files on your digital recorder, including a fully manual method, a drag-and-drop method, and one which is automated using the Dragon Auto-Transcribe Agent. This latter method is available only for the Professional, Legal and Medical versions of Dragon. Learn more about this process on our Digital Recorder Tutorial. Nuance Digital Recorder Tutorial and Product Review: This is a great summary document from Nuance related to use of digital recorders. Digital Recorder Tutorial - this is a brief overview from Speech Recognition Solutions and cover creating a digital recorder profile and the 3 main ways of converting your file to a text document. Philips DPM8000 Set-Up and Use Instructions: A guide from Speech Recognition Solutions to assist in getting you started. Dragon Medical 360 Direct is a recently released cloud-based medical speech recognition program designed for institutions and implemented on Windows-based computers on an institutional basis. What is Dragon Direct? Dragon Direct is a new cloud-based medical speech recognition product designed for institutions and which works with Windows-based computers. It works with an accuracy similar or better than Dragon Medical Practice Edition and with a similar speed. It does not include many of the advanced functionalities of the full version of Dragon, but does include full "Text Control" (ability to select and correct text by voice) and the ability to create text and step-by-step commands. Unlike other versions of Dragon, Dragon Direct is sold on a subscription basis. Are there limitations to Dragon Direct? The most important difference between the standard version of Dragon and Dragon Direct is the fact that all processing is done remotely on a Nuance server and therefore use of Dragon Direct requires an Internet connection. Can I buy Dragon Direct for my own use? No. At this time Dragon Direct is sold only to institutions. It is hoped that a version for individuals might some day be available. What microphones will work with Dragon Direct? Almost any on-board sound card, external USB sound adapter, and dedicated USB microphone will work with Dragon Direct. Our full "guide", linked below, reviews some of our favorite microphones. When using the server version of Dragon Direct, we strongly recommend the use of a hand-held USB microphone such as the PowerMic II or SpeechMike premium since drivers are available for these microphones to allow use of buttons with Dragon Direct via Citrix. For local installation of Dragon Direct, special drivers are not requires. Where can I get the drivers for use with the PowerMic II or SpeechMike Premium for Citrix based implementations of Dragon Direct? These should be available from your user support or IT Department. Where can I learn more about Dragon Direct? We have put together an extensive "Unofficial User Guide" for Dragon Direct and it can be accessed from the links section below. Speech Recognition Solutions "Unofficial Dragon Direct User Guide. This is our own guide to Dragon Direct and based on our use of both the server-based and local version of the application at Dartmouth-Hitchcock Medical Center. Nuance on-line Dragon Direct User Guide. While not quite as extensive as our own guide, this is a great source of information for new users of Dragon Direct. Nuance University Dragon Direct Trainig Course This is Nuance's main training guide for Dragon Direct and a simple to follow and fairly comprehensive guide to the Application Nuance Dragon Direct Quick Reference Guide This is a short but concise one-page reference guide provided by Nuance. Although installed on your computer at the time you install Dragon, the User Guide for you version is buried fairly deeply on your hard drive. To make it easier for you, we have have official User Guides for a number of recent versions of Dragon. For a number of years Nuance has been putting together "End-User Workbooks". Designed for specific version of Dragon, each provides in depth information and tutorials on completing common functions with Dragon. Below are links to the workbooks for the last few versions of Dragon. These are large PDF documents which can be downloaded to your computer. How many installations can I do with a single license? Keep in mind that the licensing agreement limits use of your license (and use of the software) to one person only. This having been said, it is recognized that many or most of us have multiple computers and legitimate needs to use Dragon on a variety of machines. For this reason Nuance allows you to do multiple installations. Nuance does, however, track these installations and they are not unlimited. The exact number of allowed installations has varied over the years and is typically in the range of 4-6, although more recent versions have indicated that only 2 installations are allowed. An exception is the premium version of Dragon, which on the basis of the end-user license agreement allows only a single install. Since these are tracked, and an uninstall is deducted from your installation allotment, you should be very sure to do an official "uninstall" from your control panel when you stop using a machine, retire it for any reason, or decide to reformat your hard drive and start from scratch. If you have a legitimate need to have more installations than Nuance allows, please give us a call and we can work with Nuance in getting you additional installations. The recently released DMPE2 allows you to install on up to 4 computers, for a single user. If you need additional installations - and you purchased from us - please give us a call and we can request another 2 installations from Nuance. I'm setting up Dragon for a child and the training text is too complex. Is there a way to simplify the training text? Yes. You can create your own training text. See the link below for detailed instructions. I can't find my activation code and need this in order to perform an upgrade. Where can I find this? This can sometimes be a bit tricky. The obvious place to find this is the disk sleeve that contained your original installation disk. If you have lost this, we show some ideas at the link below. Changing the Training Text: This guide provides instructions for adding a new training text and is intended to help the parent or teacher needing to create a simplified training text for a young child. Identifying your Dragon Activation Code: This brief document will give you some ideas on finding your activation code on older versions of Dragon. Installing Dragon from a USB "thumb drive": This guide walks you through the steps of installing Dragon on a tablet or device without a DVD drive. What microphones are compatible with Dragon for the Mac (Dragon Dictate)? The important thing to know about Apple computers is that they have an audio input jack which is made for "line-in" voltage and not "mic-in" voltage. The result is that virtually no standard computer microphones will work when plugged into the mic jack on a Mac. As bad as this may sound, it turns out that virtually every microphone works better when connected to a computer via USB, so this leaves the Mac user almost all of the good options available for a PC. You can use either a microphone with an integrated USB connection or any analog microphone connected via an external USB adapter. When so connected, virtually any microphone will work on a Mac. Are there any tricks to setting up a new microphone when using Dragon Dictate? Yes and no. It simply requires you follow the correct steps. Read our simple tutorial on Adding a new microphone on Dragon Dictate. Existing hand-held Philips mics are NOT compatible with a Mac. While the Olympus DR-1200 will allow use of the microphone and track ball, other buttons are not programmable. Adding a New Microphone with Dragon Dictate: This brief tutorial walks you through the steps of setting up a new microphone on Dragon Dictate. Using the PowerMic II with a Mac: this page shows you how - with the help of a free third party utility - you can use the PowerMic II (our favorite hand-held microphone with Dragon Dictate. Resources for the Mac User: If you are using a Mac, whether with the native Mac OS, or running a Windows operating system on your Mac, this page has a variety of helpful resources. Microphones for the Mac User: MacIntosh computers require the use of a microphone which interfaces via USB. This guide provide an overview of good options. Making a simple sound recording on a Mac: This brief tutorial we found elsewhere shows you how you can troubleshoot your microphone by making a simple recording with QuickTime. Push-to-talk Microphone Programming for the Mac: this tutorial shows you how you can use two simple and inexpensive utilities to allow push-to-talk programming of a PowerMic II or other hand-held mic with Dragon Dictate. Cost effective upgrade: Looking to upgrade from the microphone that came with Dragon but have a limited budget? Consider the Radio Shack Sennheiser knockoff (see "Intermediate Level Microphones). Best Wireless Microphone: Looking for the best wireless microphone? Pick the Sennheiser DW Pro-1 or DW Pro-2 (see "Wireless Microphones"). If you absolutely need Bluetooth, consider either Sennheiser BW900 or the VXI Xpressway. Low Profile Mic for Use with tablet or notebook PC: Need a low profile microphone to use with your tablet PC? Get the Buddy Stylus mic (see "Hand-held Microphones"). Will a better microphone make a big difference in my accuracy? Keep in mind that the biggest determinant of accuracy is your dictation style and the best microphone in the world won't give you great accuracy if you mumble or slur your speech. This having been said, with all other factors being equal, a higher quality microphone will provide better results. This is, in fact, why we started Speech Recognition Solutions - to provide a place for you to learn about and purchase better microphones. Why is a good microphone better? Generally for two reasons: 1) it has a higher quality microphone element that more accurately and sensitively picks up the vibrations from your voice and converts it to the analog signal which will ultimately be converted to a digital signal and used by Dragon 2) by means of either geometry or dedicated noise rejection circuitry it will more effectively eliminate contaminating external noise. Regarding this latter point, the difference between an inexpensive and highly expensive microphone tend to be fairly minimal in an extremely quiet environment. In moderately loud situations the more expensive microphone will tend to perform much better, even if not perfectly in such a situation (external noise is never good). You are brand new to speech recognition and haven't yet determined whether you have the ability to speak in the more disciplined way needed to make it work well (an expensive microphone might increase your accuracy from 95% to 99%, but if your dictation style leaves your baseline at 75%, don't expect a great microphone to alter this tremendously). So make sure the technology works for you before spending big bucks on a new microphone. You use Dragon only occasionally and not for high-stakes situations. By this we mean if you are using it for blog posts, you might not worry about superb accuracy, while if you are a doctor or lawyer and your speech recognition work-product is a critical means of communications or may end up in court, it will probably be worth the bucks to get a great microphone. You are on a limited budget. In this situation we suggest you consider a compromise type of product. The Radio Shack "Sennheiser ME3 Knockoff" (unofficial term) is an amazing microphone for the dollar and suffers only from a short 90-day warranty and perhaps a slightly longer than needed microphone boom. Is the microphone which is bundled with Dragon are reasonable product? Not really. We realize that Nuance couldn't sell the software without including a starter microphone, but be aware that this is $5 product and you should consider it a "proof of concept" microphone. It's neither durable, comfortable, nor particularly accurate. So if you've tried your software find it to be the product you were hoping, we recommend that you upgrade to something a bit more worthy of the software you just paid a pretty penny for. See our quick recommendations above for some quick suggestion, or visit our Microphone Selection Guide for more detailed recommendations and comparative information. Why are some of the least expensive microphones given the highest ratings in Nuances compatibility scoring? I think the easiest way to say this is that Nuance does not want to openly admit that the microphone they bundle with the product is a $5 piece of junk, so they have creatively stretched their standards a bit to give it a good rating. Beyond this, I think you can reasonably trust the rest of the rating provided by Nuance. I switched to a new microphone with a USB interface and I'm getting terrible results. What's wrong?The most common reason for this (and it's fairly common) is that the user simply plugged in the new microphone via a USB port and expected Dragon to use it. If Dragon is accustomed to using a mic plugged into the microphone jack, then it is using the on-board sound card. Simply plugging in a USB microphone does not change Dragon's sound system preference. In fact when doing this, particularly on a laptop computer, Dragon will often be trying to use the small on-board microphone on the notebook and you can imagine that this will work poorly. In order to resolve this, upon plugging in a new microphone which is interfacing via USB, you must subsequently open Dragon and either add the new set-up a new "source" or create an entirely new user profile based upon the new USB device/microphone. Please refer to our "Microphone Set-up and Trouble-Shooting Guide" for details on how to do this. Microphone Selection Guide: This comprehensive guide from Speech Recognition Solutions reviews all the commonly sold microphones for use with speech recognition software and may lead you in the right direction when considering purchase of a speech recognition microphone. Microphone Set-up and Troubleshooting Guide: this thorough guide should be read by every speech recognition user and certainly should be consider when setting up a new microphone with the Windows version of Dragon. Dragon Dictate Microphone Set-up Guide: this brief guide will walk you through the steps involved with adding a new microphone to the Dragon Dictate program on the Mac. Vista Microphone Troubleshooting Guide: If you are using Windows Vista and are having trouble setting up a microphone for use with Dragon, this guide might provide some needed assistance. Using an iPhone as a Portable Recorder for Dragon: If you own an iPhone, this guide shows you how you can use your smart-phone as a digital recorder to capture dictation for transcription by Dragon. Making a simple sound recording on a Mac: This brief tutorial we found elsewhere shows you how you can troubleshoot your microphone by making a simple recording with QuickTime. Compatibility: most commonly sold external USB sound adapters are specifically made for use with the common electret microphones sold for use with computers. As a result they provide the right voltage and compatibility is pretty much certain. On board sound cards tend to be some added circuitry on the motherboard and not a dedicated device, so they are much more variable. In the case of an Apple computer, normal computer microphones simply don't work when plugged into the microphone port and MUST be connected with a USB adapter. If you are using a microphone which does not include speakers, a "monoplex" USB adapter will simplify things a bit in so much as plugging it in will not do anything to alter your system's default sound out device. When a "duplex" adapter (one that handles both sound in and sound out via USB) is plugged in your operating system tends to assign it as the default sound-out device, which may not be what you want if your microphone doesn't have speakers. It is for this reason that we bundle the Sennheiser ME3 and Audio Technica 8HEmW (both microphones without speakers) with a simple monoplex USB adapter such as the MA version of the Andrea Pure Audio USB adapter. Until it went out of production we also recommended the simple Andrea USB adapter. Transcribing one's speech provides a number of challenges to Dragon. Key to selecting the corrected words is having the right words to choose from. For the medical user, this means selecting the specialty vocabulary appropriate for the expected dictation. For the legal user, this means using the Legal version of Dragon. All users, though, have a lexicon of specific words that they use regularly and which may not be in Dragon's vocabulary or may not be formatted or weighted sufficiently to be chosen when you speak the word. For this reason, it is hugely helpful to manage your vocabulary and add certain words. Why should I customize the vocabulary in Dragon? While not essential, by customizing your vocabulary and adding special words which may not be in the Dragon vocabulary and which you will be using regularly, you will significantly improve your recognition accuracy and limit the need for corrections. As an example if you commonly dictate your wife's name which happens to be Karin Smyth, you can expect that Dragon will almost certainly insert it as "Karen Smith". By adding the name as you spell it to the vocabulary, Dragon will both recognize this as a preferred spelling and statistically weight it more heavily and therefore get it right. In addition to names, many other proper nouns might be added to the vocabulary to assure that they are transcribed correctly. The names of local places, business, etc., particularly if the individual components of the name are common words might be added, such as "Heart Failure Service", "Same Day Surgery Unit", "Gary's Auto Body Shop", etc. How do I add a word to the vocabulary? Adding a single word or phrase can be done several ways. Say "Add word to vocabulary" or navigate to Vocabulary > Add new word or phrase. On the box that opens, simply add the word and click "save"
If you have already typed a word in your document, select it and say "Add to vocabulary". This will open the same window used above to add a single word and will add it automatically. Just click "save". Open the Vocabulary Editor either by saying "open vocabulary editor" or by navigating to Vocabulary > Vocabulary Editor. In the top section add you word, exactly as you want it to appear, in the "written form" box.